The Yankees swept the day/night doubleheader in Baltimore on Saturday, and find themselves only seven games behind the Boston Red Sox in the AL East (just six games back in the loss column). The Yankees took the day game by a score of 10-3 behind the pitching of J.A. “Happer” Happ, his fifth consecutive Yankees victory, and then swept the doubleheader by defeating the O’s 5-1 in the nightcap, a win delivered courtesy of Sonny “Pickles” Gray. Granted, Gray was facing the worst team in Major League Baseball and they weren’t playing at Yankee Stadium so he had the right conditions for a stellar game. 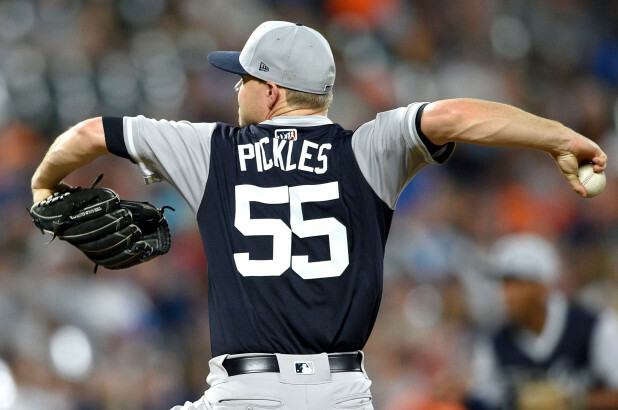 The last time “Pickles” had faced Baltimore, he was pounded for seven runs in only 2 2/3 innings (a 5-7 loss to the O’s on August 1st but that game was in the Bronx. He pitched six scoreless innings of three-hit ball against the Orioles at Camden Yards on July 11th and has only given up one run to Baltimore in three Camden Yards starts this year. He clearly likes pitching in Baltimore even if he can’t pitch anywhere else so I temper Saturday night’s performance. Still, it was a win and that’s what matters most. Gray threw 79 pitches in 6 1/3 innings, limiting Baltimore to three hits and no runs. He struck out seven and didn’t walk a batter until the final guy he faced in the bottom of the 7th inning. After the game, Gray proclaimed himself as “one of the best starting pitchers in this league” which I thought was a bit much. Maybe he was saying it for the benefit of O’s GM Dan Duquette (future trade possibilities), given his propensity for ‘elite-like’ games in Baltimore. His statement could not have been meant for Yankee fans because we know better. Good for Gray to have confidence, but he shouldn’t rush out to buy shelf space for a Cy Young Award. Perhaps the disappointment of the night game was the inability of reliever Tommy Kahnle to preserve the shutout for “Pickles”. It was a messy bottom of the ninth as Kahnle gave up three hits, the last one a single by Yankees castoff Jace Peterson which scored Trey Mancini with Baltimore’s only run. Manager Aaron Boone was forced to bring in Dellin “El Acido” Betances to get the final out with two runners on base. Fortunately, he struck out Caleb Joseph on five pitches to prevent an Orioles rally and gained his first save of the season. There’s no way that should have ever been a save situation and it reinforces why Tommy Kahnle has a long way to go before he can be a trusted member of the bullpen again. In the day game, I was a little worried when J.A. Happ gave up two runs in the bottom of the 2nd inning which gave the O’s a one-run lead. He has pitched so well for the Yankees since his acquisition in July and it is inevitable that the wheels will fall off. Happ is exactly the type of trading deadline deal you want to make. Acquire a guy who outperforms his time with his previous club and just wins down the stretch. The Yankees other lefty July trade target, Cole Hamels, is doing a tremendous job for the Chicago Cubs, but I agree that Happ was the right choice given his AL East experience. Happ ended up with yet another quality start, holding the O’s to just those two runs on five hits over six innings for his 15th win of he year. Happ (15-6) walked a batter and struck out nine and is only a win behind Luis Severino. Luis Cessa, the 26th man, finished up the final three innings for his first save despite the blowout. Miguel “Papá ” Andujar, who has become everybody’s favorite choice for AL Rookie of the Year, hit his 21st home run in the first game with 4 RBI’s to pace the Yankees. Aaron “Hicksie” Hicks had three hits and 2 RBI’s. Luke “Louis” Voit got the start in the first game over Greg Bird, and delivered a run-scoring single. Brett “Gardner” Gardner also chipped in a couple of RBI’s and Gleyber “GT” Torres, with two hits, had an RBI as well. In the night game, Gardy, Hicks, and Giancarlo “G” Stanton all contributed an RBI, and Austin “Ro” Romine smacked an insurance-providing solo homer in the top of the ninth. Greg “Bird” Bird finally got the start after two successive starts by Luke Voit. He responded to the challenge for his position by going 0-for-3 with a strikeout. The Yankees (82-47) play the Boston Red Sox six more times with three games in New York and three in Boston. The New York series is Tuesday, September 18th through Thursday, September 20th, while the Boston series finishes the regular season on Friday, September 28th to Sunday, September 30th. It’s still an uphill battle but the division title remains within reach if the cards fall right for the Yankees. Getting everybody healthy is the first course of business. Nick Cafardo of The Boston Globe had some interesting comments about the Yankees in his weekly Sunday Baseball Notes. He stated the Indians and the Yankees “were exploring the possibility of (Andrew) McCutchen, who has cleared waivers and can be traded anywhere”. I find it hard to believe the Yankees would add McCutchen due to the luxury tax threshold limitations but I guess you can never underestimate GM Brian Cashman. I wouldn’t mind seeing McCutchen in pinstripes but then again, he’s a redundant luxury once Aaron Judge returns to good health. Cutch does have that “it” factor and could be capable of delivering huge hits when it matters the most even if he is no longer the player he once was for the Pittsburgh Pirates. Cafardo also said the Yankees were in the hunt for Giants lefthander Madison Bumgarner at the July trading deadline but found the price too high. Bummer, I would have loved Mad-Bum on the Yankees. Of course, I have no idea what the Giants asked for. Handing over our ten best prospects probably would not have been a good idea. LOL! I doubt that was the cost but it probably wasn’t too far off. Congrats to former Yankee Matt Holliday for his return to the Majors with his original team, the Colorado Rockies. Holliday was unable to wear his original number (5) since it now belongs to long-time Rockie Carlos Gonzalez and the number he wore with the Yankees (17) is retired in honor of Rockies great Todd Helton. So Holliday opted for number 7 which of course is a hallowed number around here. Holliday went hitless in his Rockies debut on Friday after an absence of ten years in a Colorado uniform but he delivered a pinch hit homer yesterday against another one of his former teams, the St Louis Cardinals. The Yankees conclude their series at Camden Yards today. Luis Severino (16-6, 3.28 ERA) will face Dylan Bundy (7-12, 5.31 ERA) tonight at 8 pm ET before the team heads home (sleep? who needs stinkin’ sleep!). It would be great if Sevy could pitch like he did in the first half. We need THAT guy hitting all cylinders for the sprint to the finish. Baltimore is going to lose 100 games this season with or without our help. We might as well move them one game closer. With the Chicago White Sox and Detroit Tigers on tap for the seven-game homestand starting Monday, the Yankees must continue to put the pressure on the Beantown Bunch. These are the games that we can and should win before we face the Wild Card contending Oakland A’s and Seattle Mariners on the the last West Coast trip of the regular season starting on Labor Day.